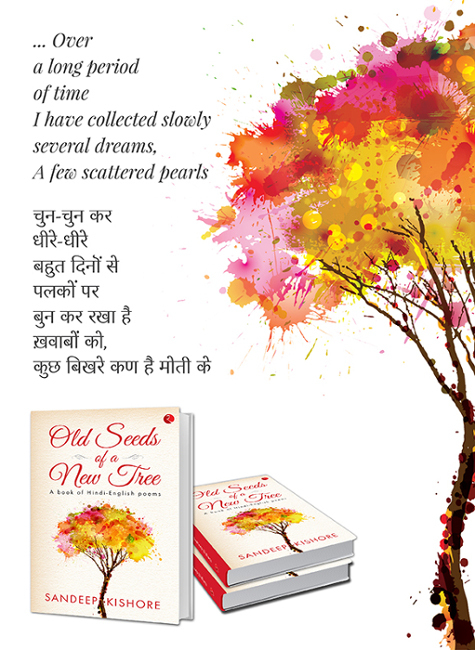 Old Seeds of a New Tree is a bilingual book of Hindi-English poems. Originally written in Hindi, I have self-translated these poems into English for global connect and tried to keep the core ethos of the poems similar to the original ones written in Hindi, though they may not be literal in translation. Poems, much like feelings, love, dreams, joy, aspirations and hope, are universal. They need to be shared with one and all. The poems in this book are like mirrors! They reflect one’s innermost thoughts when read. When you close your eyes, they speak to you. They connect with your own frame of mind and then draw you out to think beyond… Old Seeds of a New Tree will draw you out from the normal day to day world to a different realm. The poems in this book will talk to your heart and challenge your mind to seek higher, different altitudes. The affection and support from readers all over the world for my first book of poems, Your Shadow Wants to Walk Alone is immense even two-plus years after its publication. I get many messages on how poems from the book connect with you in your own ways. There’s nothing more gratifying and humbling for an author than to connect with readers in their own individual way. Many of you have also written that you started reading and conversing in Hindi again after reading the book! Thank you for your love and affection. Each one of you inspire me every day. You keep me going and urge the creative side of me to do more. I do look forward to hearing from you on my new book, Old Seeds of a New Tree. I hope you like these poems as much as I have enjoyed writing them for you.